West Central Texas location is 45 minutes North of Abilene, Texas and 3 hours West of Dallas. Utah location is 45 minutes North East of Salt Lake City. Outdoor Solutions team will provide driving directions to each location. Both of our facilities are provided by Outdoor Solutions outfitters, who are accustomed to hosting groups. Each lodge provides double occupancy bedrooms with a private bathroom, large common areas for relaxing and discussing the day’s events, class room area for covering the curriculum. Full home cooked meals are prepared and served by our staff. Drinks are also provided while on the range. We promise you will not leave hungry. Since our Level I Long Range class is geared towards hunters, we use hunting gear from our manufacturing partners. Part of our focus for this Level I class is using all factory gear, from VanGuard hunting rifles from Weatherby chambered in 6.5 Creedmoor to factory ammo from Hornady and quality optics from Zeiss. While custom rifles and hand loaded ammo are nice, they are also expensive. We will show you how to be an effective hunter at extended ranges with the proper factory equipment. Once on site, students will be transported to the various ranges by side by side ATV or 4x4 pick up. Our know distance ranges were built to our specifications and were designed to allow multiple students to have their own shooting lane. Each location has an enclosed shoot house with concrete floors and custom benches to shoot from. The known distant ranges have 7 individual shooting lanes with AR 500 steel starting at 300 yards in 100 yard increments out to 1000 yards. Our hunting scenario ranges have multiple stations with each station providing multiple targets at various distances and sizes. Each target provides an opportunity for a different shooting position, utilizing natural terrain, students gear and shooting sticks. Our Utah location also offers the opportunity for elevation changes during the course. Students should plan on arriving to the lodge between 3 pm and 5 pm, which will allow time for you to settle in your room and tour the facility. Dinner is typically around 6pm, followed by the orientation and curriculum review. The long range curriculum review will include instructor and student introductions, long range terminology, shooter/spotter dialog, equipment review and range safety. Building range card for personal rifle. After spending hard earned money, for a Western Big Game hunt, the last thing you want is to have a trophy of a lifetime walk away because you were not comfortable with the shot, or worse yet, taking the shot and ending up with a wounded animal. We have been sending big game hunters around the globe since 2003 and to help prepare our hunters for the best experience possible, we let them know they need to be prepared to shoot out to 400 yards and further in some cases. The majority of the time, we are met with the same response, “I’ve never shot that far before!” Our schools were created pretty much out of necessity. Our long range classes not only reconfirm shooting basics but teach the fundamentals of proper shooting techniques at extended distances in various shooting positions. More importantly our long range class exposes a shooter’s limitations and the limitations of his or her equipment in the field wh ere it counts, in turn making them a more confident and ethical hunter. Outdoor Solutions instructors are highly qualified with years of experience teaching classes and backgrounds in military or law enforcement. 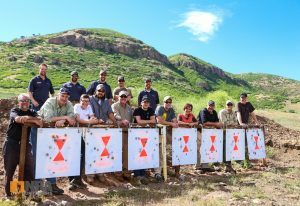 Starting in 2012 we founded and ran the Texas and Utah long range classes for the NRA Outdoors program and are now continuing the same great classes under the Outdoor Solutions brand. Most important our instructors are passionate hunters and understand what it takes to be successful in the field. What you won’t find with Outdoor Solutions long range instructors are attitudes or egos, they truly enjoy teaching and watching our students become proficient shooters at extended ranges. Even though our Level I curriculum is detailed and covers a number of long range principles and techniques, it is taught in a manner that is not overwhelming or confusing. Our small class sizes and excellent instructor to student ratio, means everyone receives plenty of individual time with an instructor. No matter your experience level with long range shooting, you will walk away from the class with new found skills that can be applied in the field where it counts. Our unique lodge settings chosen from our network of Outdoor Solutions Outfitters opens access to hundreds of thousands of acres to put you in real hunting scenarios. Small group sizes give everyone the opportunity to spend the next two and half days building camaraderie with fellow like-minded students and instructors.